Fragments of ancient music have been found going back as far as the eighteenth century B.C., the most ancient ones recorded on cuneiform tablets, but there is only one complete song from antiquity known to have survived: the Seikilos epitaph. It was discovered carved on a marble column-shaped stele in Tralleis, near Ephesus, Turkey, in 1883, and is now in the National Museum of Denmark in Copenhagen. 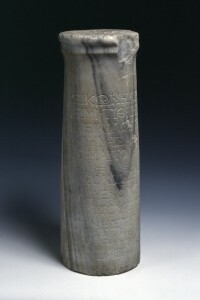 Dating to the first or second century A.D., the stele announces its function clearly in the inscription. “I am a tombstone, an image. Seikilos placed me here as an everlasting sign of deathless remembrance.” The last line is damaged, reputedly by Anglo-Irish railway engineer Edward Purser who was on site building the Smyrna-Aidin Ottoman Railway when the stele was discovered and who sawed off the base so his wife could use it as a flower display, but it appears to be a dedication from Seikilos to a Euterpe, perhaps his wife? I suppose this is how they got people back into a revelrous mood when things were winding down, by reminding them life is fleeting so party while you have the chance. I’m not sure how well that would go over today, although given the season, you could totally take a tip from the ancient Egyptians and pass around the realistic mini-corpse in a coffin when your Halloween party looks to be flagging. Anyway, because of the clear alphabetical notation Seikilos’ song is playable today. Lyre expert and ancient music researchers Michael Levy has a wonderfully virtuoso performance on his YouTube channel for which he uses a wide range of lyre techniques to give it that zesty drinking song vibe. Musician and Oxford University classicist Armand D’Angour is working on a research project to use the latest and greatest discoveries on Greek musical notation to bring ancient music back as accurately as possible. The Greeks had worked out the mathematical ratios of musical intervals – an octave is 2:1, a fifth 3:2, a fourth 4:3, and so on. While the documents, found on stone in Greece and papyrus in Egypt, have long been known to classicists – some were published as early as 1581 – in recent decades they have been augmented by new finds. Dating from around 300 BC to 300 AD, these fragments offer us a clearer view than ever before of the music of ancient Greece. Compare Dr. Creese’s version with Mr. Levy’s. I find it fascinating how different the two performances of such a simple song can be, and it underscores the inherent challenges of resurrecting ancient music even when you have the words and melody. This entry was posted on Tuesday, October 29th, 2013 at 11:35 AM	and is filed under Ancient, Modern(ish), Multimedia. You can follow any responses to this entry through the RSS 2.0 feed. You can skip to the end and leave a response. Pinging is currently not allowed. Lovely lyrics. Music is so complex that even with notation there is a lot that must be surmised. I recall a friend of mine who was trying to learn guitar blues from notaton. It sounded odd to me. I had been exposed to a fair amount of old string music and old blues songs growing up. I picked up my guitar, looked at his notation, picked at it a bit, then commenced playing the way it sounded to me, adding the lovely slide in the bridge he’d missed. Yes, it was am almost ethereal old southern field song when it was played as one. Good lesson for both of us. He heard the music his ear was trained to, and I heard mine. We were both astonished at the difference. Hard to tell how that old Greek music actually sounded. Maybe someday we’ll figure it out. Bet the key comes out of the mountains. Having listened to both versions, I feel indeed a bit disturbed about the possible ‘social meetings’ and ‘banquets’ that Dr. Creese and Mr. Levy might have attended. Moreover, ‘banquets’ and ‘carpe diem’ songs in what is now ‘Greece’ or ‘Turkey’ probably differed from the certainly rather ‘exotic’ ones that Herodotus was witnessing in ancient Egypt and was reporting about to his fellow ‘Greeks’. At the end of the days and banquets, little Στάθης Θεοδώρου will rock all over you. Thus, I am looking forward to some sort of remixed version. Euterpe is the Greek Muse of Song and Elegiac Poetry. Lovely song. Thank you for posting. This is magnificent. One can hear in this,and read within in lyrics,universal sentiments that travel through time.A thing of beauty,tru;y is a joy forever. The Classsical ideal made this quest the central theme,as this was divine. Harmoney,balance,proportion.The piece has this. Absolutely beautiful and somewhat eerie to hear this ancient song being played and sung. I keep coming back to listen to it again and again. I am sure the whole song / tune is really amazing and beautiful. Takes me back in time. Thank you! Here’s a great arrangement of the song with lyre and symphony orchestra, recorded for the video game Civilization V. A wonderful arrangement that captures an authentic performance and couples it with modern techniques.